Approved for wet cell and AGM batteries. Designed for use in fresh and saltwater marine applications. 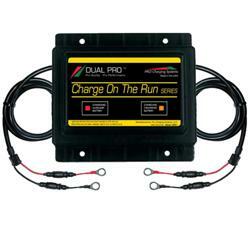 Single bank battery charger designed for one 12 volt battery. Reverse polarity protected, ignition protected. 5 foot cables to battery. Charger cables install under battery terminals for clean, permanent installation. Ignition protected (US Coast Guard 33 CFR 183.410) and CE approved, meets ISO 8846 Marine standards. Two year warranty. Dim. 4"H x 6"W x 5.5"L / Weight 4 lbs.